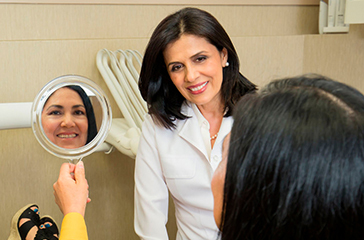 One of the cosmetic services Dr. Feryal Alidadi offers can be life-changing, as it returns a patient’s confidence to smile. Snap-On Smile is an easy and affordable way to get a fantastic smile. Snap-On Smile is made of hi-tech dental resin, which makes it very thin and extremely strong. You can drink and eat with your Snap-On Smile. It’s easy to care for and can be a fantastic temporary cosmetic solution for upper and lower teeth. It fits right over your own teeth to give you a beautiful, natural-looking smile. Snap-on Smiles can hide stains, chips, gaps or missing teeth. Snap-On Smile is an affordable, non-invasive and reversible dental solution, requiring just two short visits to Dr. Alidadi’s office. You can do this while you’re getting other dental work done. There won’t be any drilling, shots or change in tooth structure. You can eat and drink while wearing Snap-On Smile. They can be worn every day. 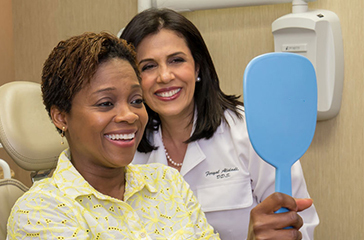 With proper care, your Snap-On Smile can last from three to five years, giving you time to save up for a more permanent cosmetic solution. smiles with gaps, stained, crooked or missing teeth. those who aren’t candidates for implants or bridges. anyone with an old-fashioned removable partial denture who wants a more comfortable, beautiful alternative. anyone who wants a Hollywood smile without the discomfort and expense of complex and invasive dental procedures. Dr. Alidadi takes an impression of your teeth.